GATE 2019 CCMT Counselling has been started from 8th April 2019. This year, the exam is managed by the IIT, Madras. Graduate Aptitude Test in Engineering (GATE) is a national level examination. It is conducted to offer admission into M.Tech/M.Sc in engineering/ technology/ architecture and Ph.D in relevant branches of science. GATE 2019 Score Card has been released on 20th March 2019. Through this article, candidates can get complete information about GATE 2019 including dates, answer keys, result, scorecard, etc. GATE 2019 CCMT Counselling (Registration & Choice Filling) has been started from 8th April 2019. Check here for counselling details. GATE 2019 Score Card has been released on 20th March 2019. Check here for score card details. GATE 2019 Result has been declared on 15th March 2019. Check here for result details. GATE 2019 Qualifying Cut Off for various categories has been released. Check here for cut-off details. GATE 2019 Final Answer Keys & question papers have been released on 13th March 2019. Check here for answer key details. GATE 2019 Candidate’s Responses has been released through login. Through this section, candidates can get information about result & scorecard including date, mode, etc. Candidates can check GATE 2019 result on 15th March 2019. The result has been declared only through online mode. It can be viewed by entering enrollment number/registration number & date of birth. No result/rank will be sent through offline mode or any other mode. The scorecard is available only to qualified candidates. It has been released after result declaration. GATE score card 2019 is valid for three years after the announcement of the result. Candidates should download their scorecard from 20th March to 31st March 2019. If candidates require a soft copy of it after the last date, they have to pay Rs. 500 for obtaining the same till last week of December 2019. The cut off marks has been released after the result announcement for GATE admission. Check here details about GATE cut off 2019 including releasing mode, date, last year cut off, etc. It is the minimum marks which candidates have to obtain in the examination to get admission into various PG & other courses. Cut off will be published through online mode according to the categories & papers. No centralized counselling is organized by the authority for admission to PG courses. Candidates have to apply separately for each IIT. CCMT (Centralized Counselling for M.Tech/M.Arch/M.Plan admissions) is conducted for admission to all NITs & several other centrally funded Institutions. GATE 2019 Counselling has been started from 8th April 2019 through online mode. Candidates, those have a valid GATE 2017/2018/2019 scorecard, they can apply for counselling. At the time of counselling registration, candidates have to fill choices of colleges & courses as per their preferences. Allotment of the seat will be done on the basis of rank, filled choices, category, availability of seats, etc. The answer keys for various papers has been published after a few days of the examination. Candidates can check it through online mode on the website. GATE Answer Key has been released on 20th February 2019. Candidates should submit their objection on the answer keys within a given time period against a payment. The GATE 2019 examination will be conducted for total 24 papers. A new paper Statistics (Code – ST) has been added. Students will also get an opportunity to submit the application form after the due date. IIT, Madras is the conducting authority of GATE 2019 examination. Question: Can I appear in any of GATE papers? Answer: No, you can choose paper as per your eligibility criteria. Question: Can I use one e-mail address to fill multiple application forms? Question: I belong to OBC NCL category. Do I have to upload category certificate too? Answer: No. Candidates belong to SC/ST/PwD categories only they have to upload category certificate. Question: How will I know my application status? Answer: You can check your application status by logging into GOAPS website. Question: After completing application procedure & generating a PDF file, will I able to change application data? Answer: You can make correction during the application form correction period only. Question: I have not upload the photograph as per specifications. Will my application reject? Answer: Yes. To avoid rejection you have to upload the images carefully as per the given specification & dimension. Question: For how many GATE papers can I apply? Answer: You can apply for only one paper out of 24 papers. Question: Can I use a physical calculator during the examination? Answer: No. A virtual calculator will be there at your computer screen in examination hall. Question: How many times I can apply? What is the age limit? Answer: There are no limitations in the number of attempts for appearing GATE exam and also no age limit. Check here for more GATE 2019 FAQs. Candidates can register & fill application only through online mode on the official website. GATE 2019 application form has been started from 1st September 2018 to 1st October 2018. Candidates have to upload their scanned images such as photograph (Maximum Size: 480×640 pixels, Minimum Size: 240×320 pixels & Dimension: 3.5cm × 4.5cm) and signature (Maximum Size: 160×560, Minimum Size: 80×280 pixels & Dimension: 2cm × 7cm). Candidates also have to upload certificate of qualifying degree, category certificate and/or Dyslexic certificate (if applicable). At the time of GATE registration 2019, candidates can choose three exam cities as examination centres. Candidates also have to fill ID number specified in any of the following, i.e. Aadhaar-UID, College ID, Driving License, Employee ID, Passport, PAN Card & Voter ID. Any changes after the submission of application form is not permitted. There is no need to send any hard copy of application/documents to the officials. Candidates should take a print copy of GATE application form 2019 for further references. The application fee can be deposited through online mode by using either net banking or debit card or credit card. The fee will be non-refundable & non-transferable. Indian & Foreign National candidates are eligible to apply. There will be no age limit criteria to apply. B.Tech/BE/B.Pharm 4 years Bachelor’s degree holders in Engineering/Technology after 10+2 examination. B.Sc (Research)/BS Bachelor’s degree in Science after Post diploma. Integrated M.Sc/Integrate BS-MS Integrated M.Sc. Note: Candidates, those completed/appearing their qualifying exam from countries other than India, they must complete or in the final year of their 4 years bachelors degree in engineering/technology or 2 years masters degree in any relevant subjects in science. Correction in Name, DOB, personal & academic details can be done from 27th September 2018. The official authority may send the mail to the candidate’s registered email Id regarding status of the application and defects in the application form. Candidates have to immediately rectify the identified defects within a stipulated time period. Failing to rectify the defects within a stipulated time period will lead to the rejection of the application form. Papers: GATE examination will be conducted for 24 subjects/papers. Date: It is conducting on 2nd, 3rd, 9th & 10th February 2019. Exam Mode: It will be organized in online mode (computer-based test). Type of Questions: In the examination, MCQs & Numerical type questions will be asked. Attempt: Candidates can appear only in any one paper of GATE examination. Session: Examination will be held in two sessions, i.e. forenoon (9:00 AM to 12:00 Noon) & afternoon (2:00 PM to 5:00 PM). Validity of Score Card: GATE 2019 score card will be valid for three years from the date of declaration of result. Duration: Exam duration will be of three hours. Number of Questions: Total 65 questions will be asked in the examination. Marks: The question paper will be of 100 marks. Section Common in All GATE Papers: It is compulsory to attempt General Aptitude (GA) section. Multiple Choice Questions (MCQ) 1 or 2 marks For 1 mark question, 1/3 marks will be deducted. For 2 marks question, 2/3 mark will be deducted. 30 questions carrying 2-marks each. 7 questions carrying 1-mark each & 4 questions carrying 2-marks each. 9 questions carrying 1-mark each & 13 questions carrying 2-marks. 5 questions carrying 1-mark each & 10 questions carrying 2-marks each. 10 questions carrying 1-mark each & 10 questions carrying 2-marks each. Statistics (ST): Calculus, Probability, Linear Algebra, Inference, Stochastic Processes, Multivariate Analysis, Design of Experiments & Regression Analysis. General Aptitude (GA): Verbal Ability & Numerical Ability. Aerospace Engineering (AE): Engineering Mathematics, Flight Mechanics, Space Dynamics, Aerodynamics, Structures, Propulsion. Agricultural Engineering (AG): Engineering Mathematics, Farm Machinery, Farm Power, Soil and Water Conservation Engineering, Irrigation and Drainage Engineering, etc. Architecture and Planning (AR): Architecture and Design, Building Materials, Construction and Management, Building and Structure, Environmental Planning and Design, etc. Biotechnology (BT): Engineering Mathematics, General Biotechnology, Recombinant DNA Technology, Plant and Animal Biotechnology, etc. Civil Engineering (CE): Engineering Mathematics, Structural Engineering, Structural Engineering, Geotechnical Engineering, etc. Chemical Engineering (CH): Engineering Mathematics, Process Calculations and Thermodynamics, Fluid Mechanics and Mechanical Operations, etc. Computer Science and Information Technology (CS): Engineering Mathematics, Digital Logic, Computer Organization and Architecture, Programming and Data Structures, etc. Chemistry (CY): Physical Chemistry, Inorganic Chemistry & Organic Chemistry. Electronics and Communication Engineering (EC): Engineering Mathematics, Networks, Signals and Systems, Electronic Devices, Analog Circuits, Digital Circuits, etc. Electrical Engineering (EE): Engineering Mathematics, Electric Circuits, Electromagnetic Fields, Signals and Systems, Electrical Machines, etc. Ecology and Evolution (EY): Ecology, Evolution, Mathematics and Quantitative Ecology, Behavioural Ecology, etc. Geology and Geophysics (GG): Common Section (Earth and Planetary system, Weathering and soil formation, etc), Geology & Geophysics. Instrumentation Engineering (IN): Engineering Mathematics, Electrical Circuits, Signals and Systems, Control Systems, etc. Mathematics (MA): Linear Algebra, Complex Analysis, Real Analysis, Algebra, Functional Analysis, Numerical Analysis, etc. Mechanical Engineering (ME): Engineering Mathematics, Applied Mechanics and Design, Fluid Mechanics and Thermal Sciences, etc. Mining Engineering (MN): Engineering Mathematics, Mine Development and Surveying, Geomechanics and Ground Control, etc. Metallurgical Engineering (MT): Engineering Mathematics, Thermodynamics and Rate Processes, Extractive Metallurgy, etc. Petroleum Engineering (PE): Linear Algebra, Petroleum Formation Evaluation, Oil and Gas Well Testing, etc. Physics (PH): Mathematical Physics, Classical Mechanics, Electromagnetic Theory, Thermodynamics and Statistical Physics, etc. Production and Industrial Engineering (PI): Engineering Mathematics, General Engineering, Manufacturing Processes I, Quality and Reliability, etc. Textile Engineering and Fibre Science (TF): Engineering Mathematics, Textile Fibers, Fabric manufacture, Structure and Properties, etc. Engineering Mathematics (XE-A), Fluid Mechanics (XE-B), Materials Science (XE-C), Solid Mechanics (XE-D), Thermodynamics (XE-E), Polymer Science and Engineering (XE-F), Food Technology (XE-G), Atmospheric and Oceanic Sciences (XE-H). Chemistry (XL-P), Biochemistry (XL-Q), Botany (XL-R), Microbiology (XL-S), Zoology (XL-T) & Food Technology (XL-U). Good understanding of the basic concepts, exam pattern & syllabus. Try to solve past years question paper & sample papers. Choose the best study material & GATE Preparation books for GATE exam. Make a strategy & timetable, instead of jumping straight to more complex topics. Avoid distractions & take care of your health. Solve online mock tests & revise the topics in each day difference. Candidates can get admit card through online mode by entering their enrollment ID/email address & password. There is no facility to send admit cards by post or email to the candidates. Downloading of GATE Hall Ticket 2019 has been started from 4th January 2019. Before examination start, biometric information (Photograph and Fingerprints) will be captured for randomly selected candidates. On the day of the examination, candidates must bring original ID proof (specified in application) along with admit card. Candidates should download admit card in color print. If you have any query about GATE 2019, you can ask us by leaving your comments in the comment box. I have two back logs in 8 semester can I eligible for gate 2019? Which certificate upload for gate 2019? Yes, you are eligible. But it should be cleared before taking admission in any college for m.tech. I didn’t get my 4-2 certificate… Can I apply gate with 4-1 mark list??? You can apply with provisional certificates. It will be known to you with the releasing of GATE 2019 notice. I am applying with my 7th sem marksheet is it ok? Will the person with Gate qualified in XE is eligible for M Tech Mechanical or Aeronautical ? Yes, you are eligible. However, it depends upon every colleges rules & regulation. I have one backloge subject in 8th semester(B.TECH/CIVIL Engg).Can i apply for GATE 2019? Hi, I’m just entered in my 4 th year of engineering from car ,is I am eligible fir gate from cse branch? Yes, you can write gate exam. Hi , I’m just entered in my 3rd year of b-tech from cse , is im eligible for gate from cse from branch? You can apply for GATE in your B.Tech 4th year. I am in 4th year studying mechanical(dual degree) in iit kharagpur. I want to give CS gate exam. Am I eligible? No, you can’t apply for other stream. My final sem result has been delayed for some reason, so i do not have a provisional certificate..can i upload my 7th sem marks sheet as provisional certificate?? Provide the certificate signed by HOD. I am studying 4th sem Bsc. interior designing (ID).Can i appear for gate? You can apply only in your last semester or last year. can i appear for GATE 2019? i just completed Msc Applied Fisheries and Aquaculture. Am i qualify to appear in 2019 Gates examination when I am doing my 4th year in EEE ( Electrical & Electronic Engineering )Appreciate your comments. We will update in our article when it will be started. How many cut-off marks qualifying in Aeonautical Engineering? Cut off for this year will be released later, till then you can check previous year cut off marks. I am studying 3rd year (mech). May i eligible to write gate exam? You are eligible in 4th year. Is there any restrictions in number of attempts for GATE exam? If not got eligible score….. I finished my engineering in 2013…will I be eligible to write gate 2019? How can i get notification of this? We will update in our article when it will be released. Can I write IT course as CS?? I Pursued B.E(ECE) at 2017.May I eligible to write GATE exam? I’m 2018 passout student but i hve some baglogs.can i apply gate exm 2019. The cut off marks will be announced later on. I m not compleated btech. After Qualifying GATE can i apply for btech. in computer science? Can I attend gate exam conducting on February 2019.But I am a final year b tech student not completed sem 8. Yes, of course you can apply. I have query regarding gate exam. You have to check the previous year cut off of the particular institution. Sir I have completed my b.tech 2018. What will be the qualifying degree certificate that I’ll upload? It will be known to you at the time of filing application form. However, you have to upload the last sem marksheet. which book is best to prepare for gate exam? I have passed B.Sc in Pure Sc. 3 yrs pass course from Calcutta University and passed M.Sc in applied mathematics from Netaji Subhas Open University.Am I eligible for GATE 2019 and is there any age limit? Yes, you can apply in GATE 2019.
how many time to i give the gate exam? As many as you can. I have completed B.E EEE 2012 passed out can I attend gate exam? 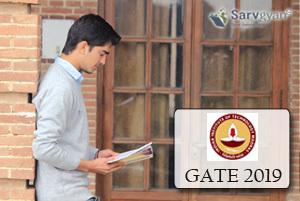 What are the percentage required in graduation to appear in gate exam. There is no such criteria. I have completed my B.E mechanical in part time 2011. Am I eligible for appear in Gate Exam. i am doing B.Tech Mech in Part time course in M/s Bharath university, Chennei.I will complete my course 2019 december. I want apper gate Exam 2020. I will apply on my final year2019. Yes, you can apply. You are eligible. How many times I can give GATE exam ? i am 2017 pass out now i m doing job , i already gave GATE in 2017 but not clear am i eligible for 2019 GATE again ? Sir! I hav 3 Backlogs/arrears and i will do my final year in Btech in 2018-2019.When I write GATE in 2019 and if i get eligible score but havent cleared my backlogs yet! what would be the situation? You will not be allotted admission in M.tech. so can i fill form for 2019exam / give gate exam while in 3rd year itself..
Am doing Msc cs..my course will complete in august..am eligible to write gate or not?and also can I do phd by the help of gate card? sir i completed my BE civil engg in 2018. my 8th semester result on may 2018, i have only a course completed certificate,my degree certificate will arrive after this year so, how to apply for gate 2019? course completed certificate is enough? for applying GATE? You can apply without it. Sir,I am pursuing my bca degree and just finished my 6th sem exam ,but have a backlog in the 3rd sem. I will be clearing that subject in the month of october and results out in november this year. Am i eligible to write the gate exam 2019?? Sir and certain websites state that BCA students cannot take up gate exam.. is it true?? will i still be eligible?? But why isn’t the course mentioned as a qualifying degree, and also while giving the application with this course specified ,will it be accepted?? I am in 3rd year(final year)of b.sc ZOOLOGY(hons),can i give GATE exam on EVOLUTION AND ECOLOGY Paper? Yes, you can apply for GATE 2019. Sir, my son Antaroop Ghosh wants to appear in GATE 2019 examination. He has changed his name from Coomar Antaroop to Antaroop Ghosh. All legal formalities for change of name has been done. His name in academic qualifications are as Coomar Antaroop. Please advise that he can appear in GATE 2019 as Antaroop Ghosh. I have given my hsc this year ie2018 i want to do biotech but i was not aware about this gate exam so i will be given it in 2019 but i will be doing my first year bsc from other college. So am i eligible to give it in 2019.can you give me some guidelines sir please. The exam can be given only after the Graduation. i finished my engineering in 2018.what is the procedure for me to apply for gate 2019? Go through this article for complete information of GATE 2019.
i am final yr student in mechanical stream studying in nepal.can i apply in bhel and iisc bangalore through gate score.. Yes, can apply if you will score the cut off marks. i am pursing b.tech mechanical engineering,can i write exam in aerospace stream? can i appear for gate on branch of mechanical engineering but now i am studying aeronautical engineering ? No, you cannot apply for another branch. If I got back in 4th Sen,5th Sem ,then am I eligible to appear in the examination. WHAT IF GATE PATTERN CHANGES THIS YEAR. GATE 2019 PORTAL IS NOT RELEASED, HOW CAN YOU SAY THE ABOVE THINGS ARE 100% ACCURATE? These are expected on the basis of previous year data. After official announcement we will update here. I graduated in 2016 ECE branch. Can I write the exam in cs? How difficult is it? You can’t write it in CS. I am 2009 passed out (B -TECH in ECE).Are there any provisions of applying Job only by GATE score card instead of doing masters and or any Doctoral courses ??????? Yes, there are many government jobs for which you can apply through GATE score. Hi , I am 2009 passed out (B -TECH in ECE) , are there any provisions of applying Job only by GATE score card , instead of doing masters and or any Doctoral courses ??????? Sir,I’m doing third year for the aeronautical engineering. Does I’m eligible? You can apply in your last year. I am a partially colour blind student. Am I eligible for PWD criteria? The criteria for PwD candidates will be released along with the official notification. I completed b.tech in 2015. Am i eligible for gate-2019? Can i give gate exam if i have a gap of 2 years after my 12th??? GATE can be filled only after your graduation. I HAVE COMPLETED MY M TECH IN VLSI AFTER COMPLETING MY M SC IN ELECRONICS.I AM ELIGIBLE TO APPEAR IN GATE EXAMINATION FOR ASSISTANT PROFESSOR JOB.